Nick and Michael Camarda's Bookcase, or simply, The Camarda Bookcase, is a non‑profit organization based in Orange County, California. 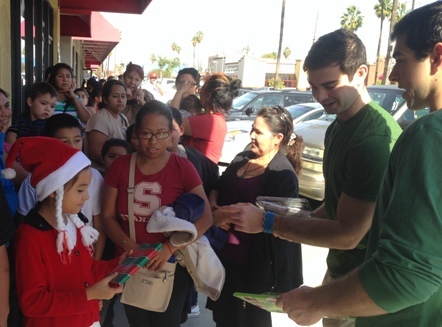 The Camarda Bookcase has partnered with countless volunteers and organizations to help make the holidays special for disadvantaged children in the Orange County area. The mission of The Camarda Bookcase is to promote literacy. It promotes literacy by collecting, gift‑wrapping and distributing new and gently used books to underprivileged children. Providing books to these disadvantaged children addresses one of the most important factors affecting literacy — limited access to books. Families living in poverty use the majority of their limited financial resources to pay for food and shelter, not books. Many of these low‑income families have no books to read in their homes. In recent years, the mission of The Camarda Bookcase has been expanded to provide books to disadvantaged individuals of all ages: adults, teens and children. How does The Camarda Bookcase work? To ensure that underprivileged children have books to read, The Camarda Bookcase collects new and gently used books donated from individuals like you. 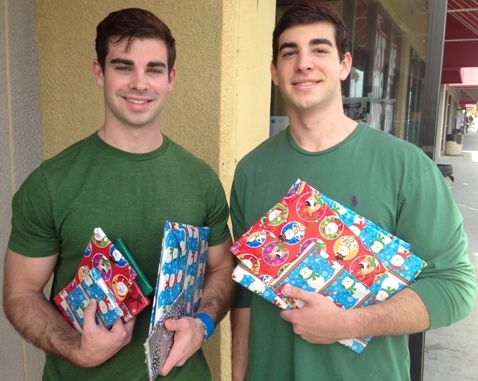 These books are then gift‑wrapped and distributed to disadvantaged children through organizations such as the Santa Ana's El Salvador Community Center and Laura's House in Mission Viejo. All books donated and funds raised stay within the Orange County community from which they are obtained. Click here to read the "Cool Kids" article produced by KABC‑TV Los Angeles honoring Michael and Nick Camarda's endeavor. of The Camarda Bookcase in 2016.
in Fountain Valley in 2016.